Are you looking for a gift for an event or tradeshow booth? 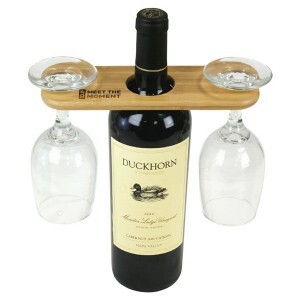 This bamboo wine butler can be placed over a bottle (bottle and glasses not included), and conveniently secures 2 stem glasses for an functional and elegant display. Your logo laser engraved in the area at left of the bottle hole. Laser size is 1 3/4″ x 5/8″. Butler is 7 3/8″ W x 6 1/2″ H x 4 1/2″ D. Min is 100 pieces at 5.00 ea, 250 at 4.50, 500 at 4.25 and 1000+ 3.99 ea. Set up is 40.00.